Patchtrends.com has come a very long way, particularly thanks to the help of Jason Spanger (santeeswapper). And as a service it is in a nice place, and my focus with it is promoting it and getting new members to join. Part of this is called "SEO" or search engine optimization. Basically, I've been working hard to make Patchtrends.com search engine friendly. As a result, and for other reasons I have made a decision that original Patchlodge.com members will appreciate. I have brought the site back from the grave! The deciding factor is that Patchlodge.com was well placed in many search engines, and it's just a no brainer to complement it with Patchtrends.com as it grows. I also want to be able to offer additional services other than just price look ups, and the innovative ideas and features offered by Patchlodge are not available anywhere else - and I still want to use them myself! Access to Patchlodge.com now requires a yearly subscription to Patchtrends.com. Patchlodge.com will receive little attention to new features, in fact I will likely trim some of those features that were never fully implemented were poorly implemented (by yours truly). Any new development at Patchlodge.com will be driven by the needs of Patchtrends.com members, so eventually to fully utilized Patchlodge.com you will need a working account to Patchtrends.com. In the meantime, feel free to login and reacquaint yourself with Patchlodge.com. Please let me know if you have any problems with the site. In the coming weeks, I am going to be slowly rolling out this information. 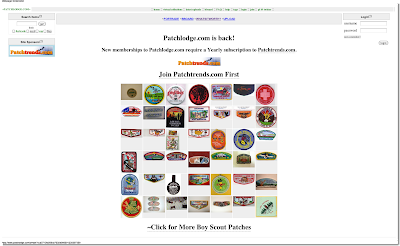 I am excited to get current Patchtrends.com members interested in using Patchlodge.com. Coming off of a successful Boy Scout Jamboree, I believe there are a lot of really awesome looking patches that are waiting to be uploaded to Patchlodge.com. More details will be emerging over the next couple of weeks, but early adopters are welcome. And as a special nod to the wonderful Patchlodge.com members who made the site what it was before I prematurely shut it down, your memberships will be honored without the requirement to join Patchtrends.com; however, the plan is to integrate member-level Patchtrends.com features into Patchlodge. Access to this will require a Patchtrends.com membership to enjoy. Patchtrends.com Is Go For Launch!